Cristina and I received two gift cards a year ago from our KC team, and for whatever reason (it could be 4 kids, 447 sold homes, building an amazing team – haha) we just hadn’t found the time to take advantage of the second one to Coalition. We had used the first card at Coalition’s sister restaurant, Red Sauce Rebellion, several months ago and really enjoyed it. A couple weeks ago for date night, we finally had an opportunity to get to the original Coalition in beautiful Excelsior. The restaurant is warm and inviting with rustic charm. We loved the look of the leather seating, marble countertops, and exposed brick… classy yet comfy! We sat at a high-top table at the back of the restaurant, near the wine rack, which was very extensive, I must say. Service wasn’t bad, but our server was a little slower to get to the table, which was a bummer being that the place wasn’t all that busy. We were very hungry (per the usual), so we reviewed the menu as soon as we got it. Their menu has a TON of great selections! We got started with the Tuna Tartare (sriracha aioli, sweet sesame soy, fresno, avocado). We are BIG sushi fans, and this was sushi grade tuna with some VERY solid spice to it, but also a sweet sauce on it that balanced the flavors of this dish splendidly. 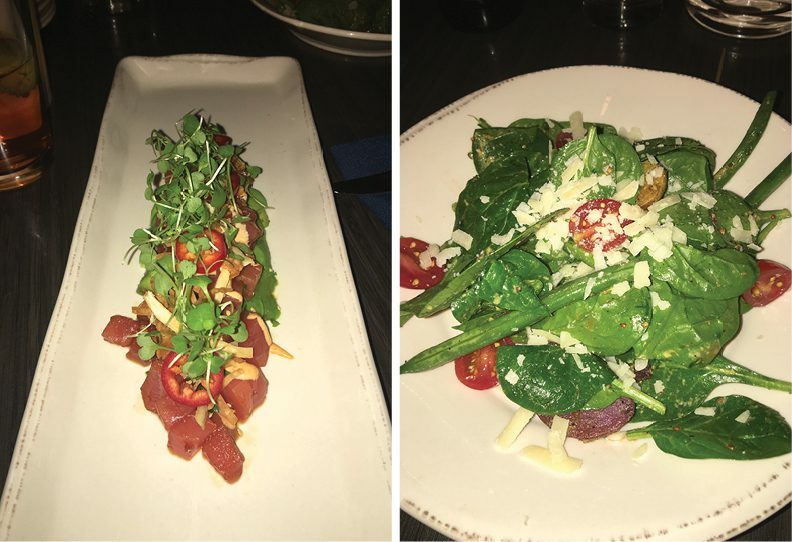 We loved this and would definitely order it again… that’s me recommending you try this! We decided to try the Warm Spinach Salad (warm spinach, green beans, bacon, baby potato, red onion, cherry tomato, mustard, parmesan) and that was pretty good. We agreed that it had a nice texture, but we just didn’t love it. I personally think it was the green beans that threw off the appeal. Cristina felt like the dressing was unusual to pair with the rest of the ingredients. For the Main course, Cristina chose the Roasted Chicken Pozole (pozole broth, hominy, pork sausage, queso fresco, avocado, corn tortilla), which wasn’t at all what she was expecting, but not in a bad way… it was AWESOME! When asked how Cristina felt about this dish, she had this to say, “The Pozole had a presentation I wasn’t expecting, but it was hands-down incredible on the flavor spectrum”! I used to work at a chicken plant in the small town of Glenwood in west central Minnesota and the plant was called Kadejan, which is all-natural, free-range chicken, and Coalition serves this chicken – I can vouch that it is a good and tasty product. We would both strongly recommend this dish. 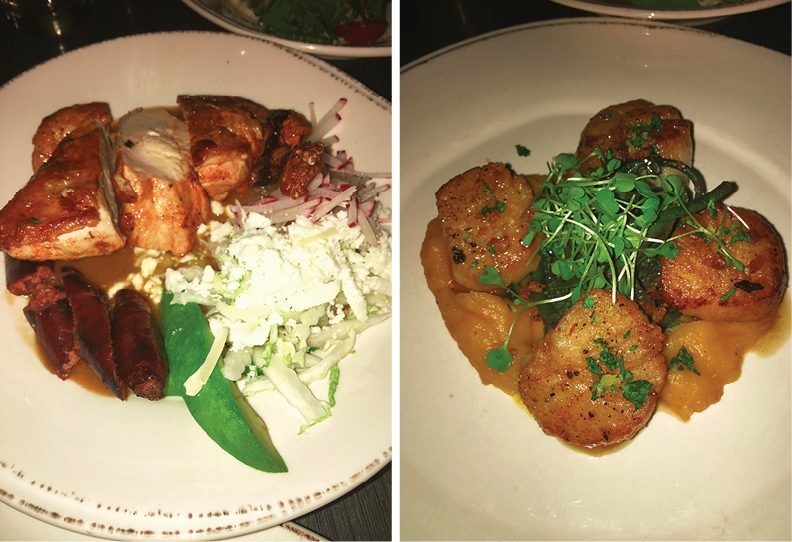 If you follow these restaurant reviews, you know that I am an absolute sucker for scallops, so of course, it was not hard to choose my main course meal. The Seared Scallops (butternut squash puree, black tahini broccolini, coriander glaze, pancetta) were paired with a butternut puree, creating a phenomenal flavor combination. I have eaten my fair share of scallops and I feel that they did a GREAT job with these – the crisp on the top was (in my opinion) perfect. The inside was cooked to perfection as well. I give another strong recommendation for this plate. Overall, we’d go back. The service was a little off, but considering that 3 of the 4 dishes were FANTASTIC, we’ll go easy on it. It’s a nice place. Give it a try if you are in the area.